Gut health has been in the news a lot lately. It seems like every week I come across a new piece of research about the inner environment of our guts and implications of the levels of good bacteria and probiotics in the gut for our overall health. And I’m not just talking about physical health, new studies are showing that probiotics may even improve mental and emotional well being and decrease anxiety. This interview I heard on Science Friday from NPR News discusses how probiotic-laced broth reduced anxiety and stress in mice. In humans, this interesting study found that four weeks of regular intake of probiotic yogurt by healthy women affected activity in the brain regions that control central processing of emotion. I’ve been finding ways to incorporate healthy, inexpensive probiotic foods into my everyday diet. I love the raw fermented cabbage sauerkraut that I buy from the New Dundee farmer at the Kitchener Market. It’s a steal- $5 for a big jar’s worth! If you have only had canned sauerkraut, you’ve got to give this real stuff a try, it’s delicious served with eggs in the morning, as a topping to a salad, or on a sandwich. When I have time, I play around with my own sauerkraut, kimchi and other fermented veggies. I’ve also been playing around with making non-alcoholic probiotic beverages- kombucha and water kefir. They are delicious and refreshing on a hot summer day! Kombucha and Kefir are both made with SCOBYs (symbiotic culture of bacteria and yeast). For kombucha the SCOBY is called a “mother” and forms a big flat whitish disk. In kefir, the SCOBY forms granules. You can get strains of Kefir that you use with dairy to make a fermented yogurt-like drink. 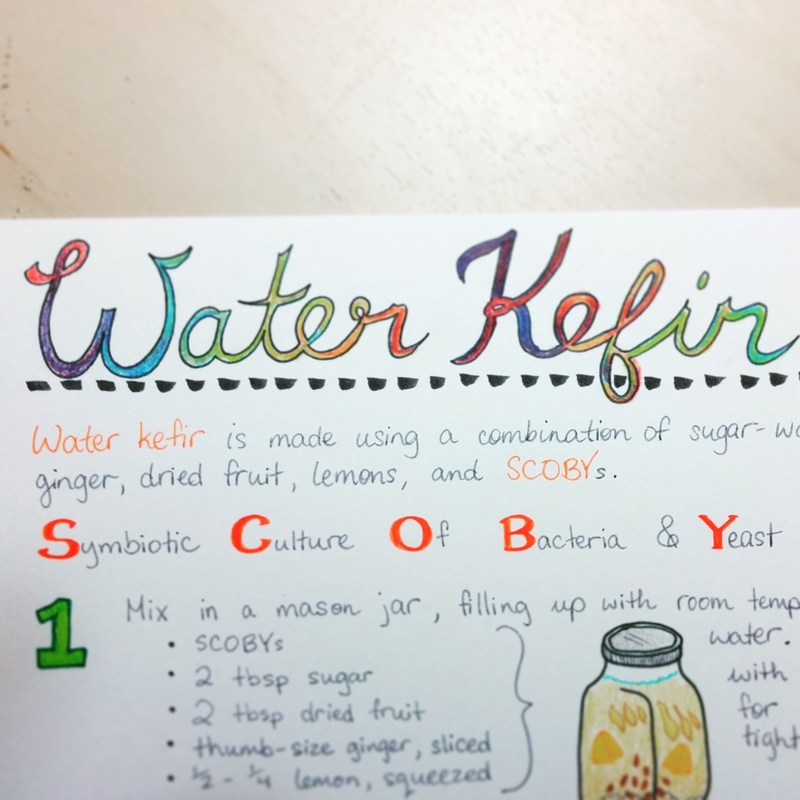 Or, you can get strains that you use with sugar, water and fruit to make water kefir. In water kefir, the SCOBY granules digest the sugars and leave their probiotic goodness in the liquid. After just a few days of fermenting you end up with a yummy beverage that’s full of probiotics, slightly sweet, a bit fizzy, and a little tangy, especially if you add lemon. Mmm! 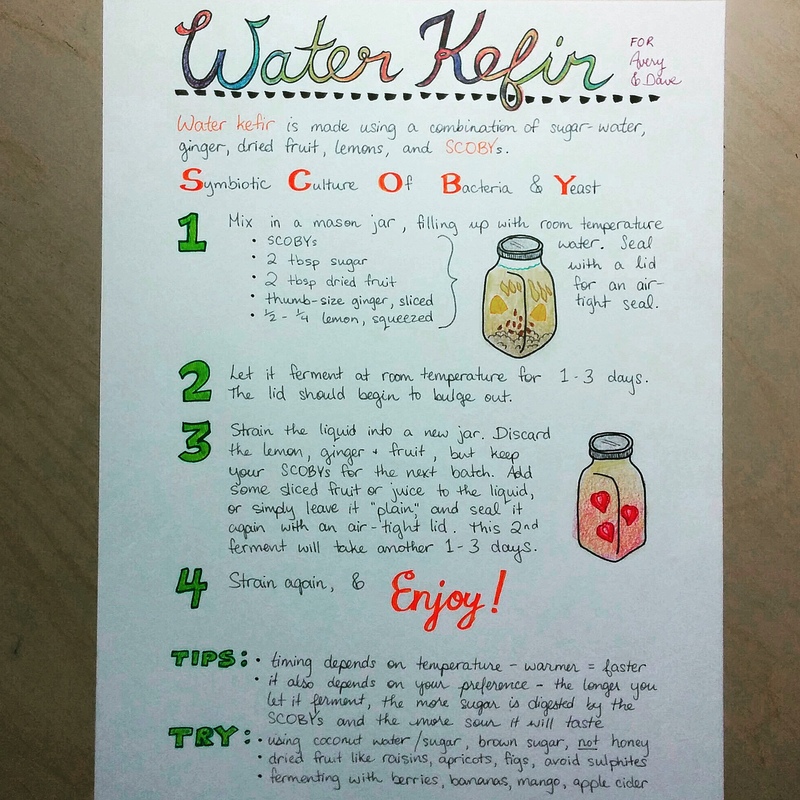 Here’s the recipe that I got from Leslie, the artist of our beautiful QSY chalkboards and graphics! She hand-wrote these pretty instructions too. Kefir grains multiply really quickly, so if you want some let me know and I can share. You can also often find people giving them away on Kijiji or buy them at health food stores. 2- Cover with the lid off with a cloth or paper towel and a rubber band. Let it ferment at room temperature for 2-4 days. Until it reaches your preferred ratio of sweet/tanginess. 3- Then, strain the liquid into a new jar. Discard the lemon, ginger, dried fruit, but keep you SCOPY grains for the new batch. 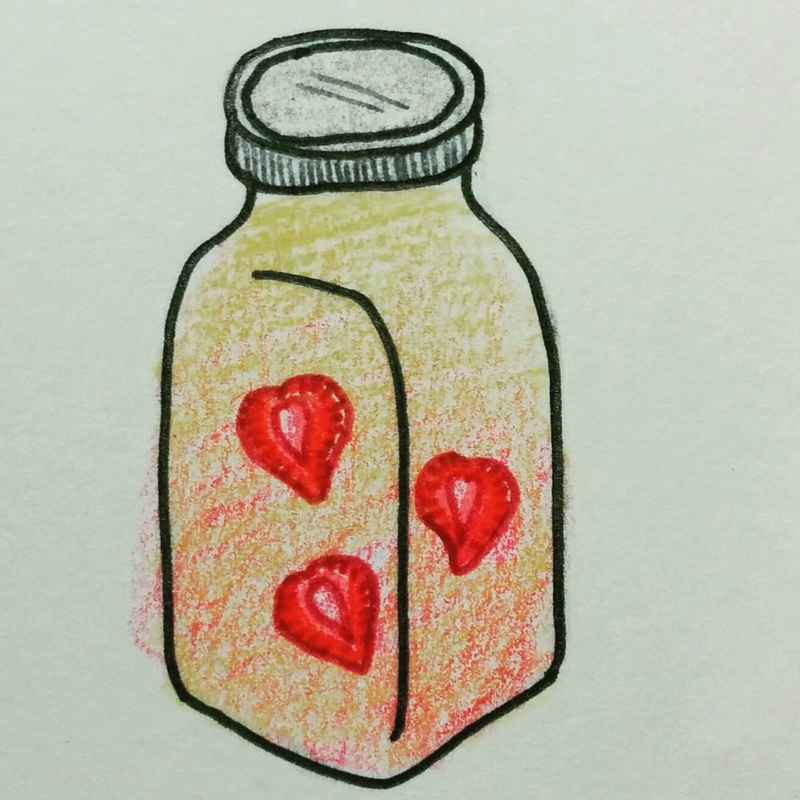 4- Drink your Water Kefir right away, or do a second ferment but add some fruit (mango or raspberries are my favorite), cover the jar tightly with a lid and let it sit for another day or two. 5- Strain again and enjoy! It keeps in the fridge just fine for a week or two! Timing depends on the temperature of your room. Warmer= faster. It also depends on your preference. The longer you let the SCOBYs ferment, the more sugar is digested by the SCOBYs and the more sour it will taste. Do not use honey as a sweetener, it will kill the SCOBYs. I’ve found organic white sugar to be best, but you can play around with other sweeteners. Once your kefir granules start to multiply, you can make bigger batches in larger jars. If you want to take a break from making kefir, you can put the granules along with a bit of water and a few tablespoons of sugar in a closed jar in the fridge. The kefir will go mostly dormant in the cool temperature. If you leave them for more than a month, it might take a few batches to really get them back in top shape for fermenting, but they can usually survive quite a while in the fridge.